We were playing a variation on one of the standard TGTMG scenarios where you have to secure an objective and carry it off the battleground. We went one further: rather than exiting on any table edge, each Player was required to exit on their opponent's edge. This adds something a of a twist to the typical game. Do you 'camp' your force, allowing the enemy to seize the Samples and then blast them with superior firepower as they try and push through your line? Or do you play the aggressor, get the Sample and blast a hole in and through their line? Or maybe something in-between - I'd like to trial a rugby-style passing game! 1 x Support Weapon (d6/4+/d6, Minigun and Combat Knife). Note, we were playing slightly different rules (see Special Rules below) which meant that we'd anticipated fewer outright causalities during the course of the game; hence the relatively small Teams. *Why Lego? Actually having posable, colourful pieces is really appealling to kids. It makes the game more lighthearted and that's got to be good. Plenty of time in the future for them to get all grim dark on me. Recently we've been looking up various paper craft scenery items and amongst the best of the bunch are from toposolitario.com - they look great and whilst some of them are a little more difficult than others, we're pretty happy with what we've pulled together already 😁 Seriously, they're really good! That's Paddy due North, with the Fuelling Station to the West and APC in the North East. Fuelling Station: a quick Lego bash, including some Lego Batman thingy? It has a footprint of about 8cm x 8cm and we treated it as Impossible, Size 4 terrain. Barracks: using IKUBEs. treated as Impossible, Size 2 terrain. It can be scaled; however takes a full Impulse and results in a Crawl distance covered horizontally. They are little 8x10x5-ish boxes. 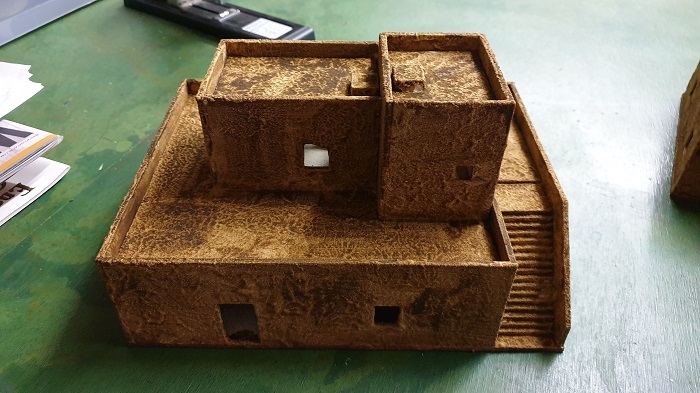 Dragon's Teeth: using Dust Tactics scenery. Impossible, Size 2 terrain that cannot be scaled. APC: a really basic model that the kids tried their luck with. I like it: easy to make and attractive. Rather than using it as a vehicle, we just used it to add to the table. UD-12 Chickenhawk: is a large vehicle (footprint of approx 20cm x 10 cm), Impossible, Size 3 and cannot be scaled. Again, it was a piece of terrain rather than a vehicle, but what a lovely piece of terrain it is! It took me about 2 hours to assemble and it looks rather special, even though we did it in grayscale. Despite the Chickenhawk's large footprint, we're playing that the side thrusters don't impede line of sight nor provide cover. Jason's red-based Team deployed on the (short) Eastern edge and Paddy on the opposite Western edge. That meant that Jason had to collect the Sample and exist on the Western front, while Paddy's orange-based Team was headed East. No Reserves were used, and Turn 1 was over once all Units had been Activated. We played some of our house rules that we've been recently trialling. The intent is primarily to increase the Player interaction (see FIIIght!) and making combat less lethal (see Stick in there!) such that smaller squads can be fielded and played i.e. they've more staying power. Walk-Shoot or Shoot-Walk: on a Unit's Impulse, they can Run, stay stationary and aim (upgrade their Skill by one factor for non-Heavy Weapons), Walk then Shoot or Shoot then Walk. Stick in there! Rather than units dying upon a failed Armour save, they're required to make a Resolution Test with their Skill die degraded for each Reeling maker i.e. a 'standard' Reeling trooper would roll a d6 instead of a d8 if they're hit when already Reeling. The more Reeling a Unit, the more likely a Resolution test will result in a 1, forcing the Unit into retreat. FIIIght! (said like in Street Fighter) Close Combat is resolved by both the Attacker and Defender rolling a Skill die - Attacker=Deffender resulst in the Defender being Hit, Attacker>Defender = Defender being Hit and Defender>Attacker means successful Defence. Cover? What Cover? Normal cover saves aren't employed for shots. Cover is afforded by terrain e.g., Level 1 barriers or when LoS is partially obsured by a base-to-base test using a Range marker. We also employed the advanced Ambush and Aiming Advanced rules. Paddy has the 'White' Team with Orange bases, entering from the West. Jason's Team is primarily darker colours with the Red bases. For the ease of reporting, whoever's secured the Sample will be referred to as the "Carrier". I tried reconstructing a Turn-by-turn report, but it's a little stale and likely wrong. Hopefully what's left is a little more engaging and gives some sense to the tension and suspense of the game. I'm still delightfully surprised that this game contains so many twists of fate. Love the mechanics. Paddy cautiously sent four of his Team, including his Minigunner, to the South East, partially covered by the Southern IKCUBE. His remaining two Troopers were sent due East, just within Short Range of the Samples. Jason split his forces: one Trooper headed along the Northern front, two made for the Chickenhawk's cockpit, his Commander and another Trooper cautiously approached, keeping just within Short Range of the Chickenhawk whilst his Minigunner took position next to the IKCUBE in the South Eastern corner, intending on providing covering fire whilst the Team grabs the Samples during the next Turn. Jason's Trooper rushed forward and grabbed the Samples - now only to get to the other side of the map! The 'plan' was to relay the Samples to the Troopers along the Northern half of the battlefield whilst the Minigunner caused as much trouble as possible. Unfortunately for Jason, Paddy has other plans. He scoots a Trooper to the South of the Chickenhawk and fires upon Jason's carrier, sending him Reeling. 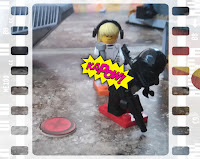 The Sample is knocked out of his hands, and goes flying.... over the Chickenhawk and almost landing on one of his fellow Troopers! Whilst Jason's initial Carrier was Reeling, a lucky roll saw it landing in the mechanical lap (?) of a Trooper to the Chickenhawk's East. With another Trooper and the Commander in close proximity, Jason was feeling smug. Well Paddy surprised me. I expected him to push his forces back towards his line (as did his brother Alex) and try and block my advance. No, he (1) wanted blood and (2) wanted to Win. Firstly he piled some more lead into my initial carrier. But for a series of extraordinarily lucky rolling, my Tooper was lucky just to be knocked even more senseless (Reeling x3-ish?) but survive he did. During my Impulse I charged one of my Troopers due West to occupy Paddy's welcoming crew in an effort to clear the way for my Carrier. The Paddy surprised me: rather than trying to block my Advance, he risked everything and charged my Carrier sending the Samples flying for the 2nd time in as many Turns! Not again!! This time the Samples were sent spinning towards the South East of the Map. Jason activated his Commander and sprinted to secure the Samples in cover behind the South Eastern IKUBE. Again, Jason took a deep breath and crossed his fingers. Meanwhile, in the North West, the melee was finally decided in favour of Paddy's Trooper - Jason was down another Trooper and his relatively safe Northern corridor to the West was now anything but. Glup! Paddy chose this time to strike. Firstly his Minigunner let lose, absolutely hammering what was left of Jason's Team. That was followed up by a Close Combat rush that decommissioned Jason's Minigunner... well what else could go wrong? Despite Paddy being unable to get into LoS to fire upon Jason's Commander; he was within range for a Close Combat assault. Paddy attacked and rolled a 5 and Jason rolled a... 5. No!! Ties in Close Combat are awarded to the Attacker, so Paddy hit! Fortunately Paddy didn't manage to penetrate Jason's Armour, so Jason just had to make a Resolution test using d10. What the, he scored a 1, meaning Jason's Commander called it quits and the Samples went tumbling yet again. And wouldn't you know it, the Samples landed right in the Map's South Western most corner. While Jason was able to bring his remaining Troopers into the fray, Paddy was able to get two of his Troopers there first - one grabbing them, and the other screening. At that point, with Mum calling out Dinner was ready, Jason graciously conceded defeat. Paddy was less than gracious in accepting his victory. He will learn. My boys absolutely loved this scenario... I don't know what it was, but I'm not complaining - it was fun! I'm really liking the FIIght house rule: it makes for some real tension come close combat and puts a small but significant advantage into the hands of the Attacker... which tends to encourage action. Our Stick In There house rule is working... okay. With so many Reeling Markers stacked on a Unit, it gets a little confusing as to which die to employ. That coupled with the difficulty of determining which die to employ when a Unit is struck by multiple hits, well we need do something to reduce the complexity some. Other than that, it is working a treat: each Trooper is able to survive more and the Command Trait becomes even more relevant when trying to string together a coherent tactical play. Resolution rolls by a Reeling Model are degraded. Easily worked out: Units with one Done Marker use their normal Resolution die. For each additional Done Marker, degrade their Resolution attempts by one die. When a Unit is hit multiple times during an Impulse, first determine the number of hits that pentrate the Unit's Armour and then roll Resolution Tests for all hits collective. For example, Solider (Armour 4+, Resolution d8) is shot at by Paddy's Minigun. The Minigun scores 3 hits. Paddy rolls 3d6 to determine Armour penetration and scores a 3, 4 and 5. Jason need roll 3 Resolution Tests, employing 1d8 (for the hit absorbed by the Solider's Armour) and 2d6 (d8 degraded to d6, for the two hits that penetrated the Solider's Armour). Also, with regard to Aiming, it felt 'wrong' that a Heavy Weapon subject to the Brace (adverse) trait are somewhat offset by the Aiming benefit... maybe I'l have to re-read the TGTMG rules. I think we might play in the future that that only small arms can be aimed, Heavy Weapons can't. We also didn't work out what would happen if the Objective was to be scattered off the table edge. Not a big problem, but annoying all the same. Next time we play this type of objective, I think we'll use a d8 to determine the distance the objective is scattered for starters, still use the scatter die and maybe just re-roll a scatter when it goes off the table? Maybe d4 and 1-2 it stays where it is? I don't know. We'll work something out.